I want to protect 2 18650 batteries with single DW01. The problem is how to increase the protection voltage on DW01 . I have read that I should use voltage divider on VCC pin. I just want to make sure 18650 wont turn into hand grenade. If it had the capability to really protect two cells in series, they would've marketed it that way. So, while you can certainly sense a situtation that is definitely overvoltage for both, you won't be able to sense the (likely) situation that one cell failed and you're now overloading the second. So, your approach is inherently bad, and you should not use a DW01 to protect two cells. Simple as that. Wrong tool for the job. Not the answer you're looking for? Browse other questions tagged lithium-ion protection circuit-protection lithium undervoltage or ask your own question. What are the possible causes of sudden extremely high internal resistances in Lithium batteries? 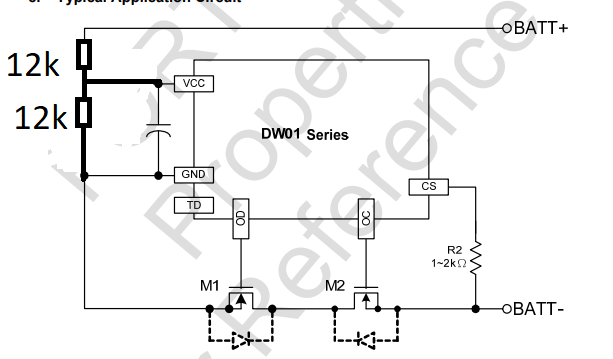 Is it possible to use a MOSFET for Li-ion reverse polarity protection when protecting a charger? Battery protection/charge board, could use another set of eyes on it? change cell protection value for 18650 from DW01? 3V3 uC input protection from higher voltage?